Where do you fall on the hierarchy of tactical shooters? Everyone with a concealed carry permit would like to believe they're ready should they ever have to use their gun in self-defense. I've seen people whose level of preparation for that possibility ranged from dedicated practice to no practice at all. Can we set up a system to estimate, all else being equal, just how prepared we might be to defend ourselves should we ever wind up in a gunfight? I think so, and I call the resulting system the Hierarchy of Tactical Shooters. It breaks down into five levels, and from lowest to highest they are as follows. Having an excellent, highly refined 1911 like the author's Wilson Defensive Combat Pistol is great, but also important is the smoothness and confidence that comes from conscientious and varied practice. I'm continually amazed by the number of people carrying guns on a daily basis--who consider themselves serious, prepared, tactically aware shooters--who never shoot. I think there are many folks out there who are scared to death of a physical attack on their person. In order to live with that fear they have to believe they can handle anything that comes their way. This means they avoid going to the range and firing their carry guns so they don't have to face the reality of their marksmanship skills. A common refrain from such people is, "How good do I have to be to hit someone at arm's length?" I would ask instead, "If you can barely hit a man-size target at arm's length on the range, what makes you think you're going to suddenly get better when someone's trying to kill you, your hands are shaking and your life depends on firing your gun fast and well?" In such a situation only well-honed marksmanship skills will save the day, and there's no way you'll possess them if you don't practice. That means making the time for practice sessions and allocating the funds for training ammo. It means paying your dues, putting in time with a gun bucking in your hand. It means, in short, burning ammo live fire. I don't say that to minimize the importance of dry fire, for it is an invaluable part of the serious shooter's practice regimen. However, let's not kid ourselves--dry fire is only a piece of the puzzle; there's no way it can do the job alone. Dry fire can't harden you to the experience of having a loud mechanism explode right in front of your face and whack your hand in recoil every time you pull the trigger. Experienced shooters barely notice the sound and recoil. Shooters who never shoot, by contrast, tend to cringe, flinch and miss their target when they fire their gun. Shooters who never shoot operate at the lowest level of competence and preparedness. The frightening thing is that most of them don't realize that that's the case. Our next level is occupied by shooters whose live-fire practice is limited to standard ranges. "Limited" is the operative word. At most public ranges you will be restricted to standing bolt upright in one place, shooting slow fire at a single target. Level 2 shooters tend to think drawing from the holster is a really advanced technique. However, these people are still a big step up from Level 1 because at least they're shooting. Thus they're probably not going to freak out when their gun goes off in a defensive emergency. They can probably be sure they possess some sort of basic marksmanship skills. Shooting in combat pistol matches gets shooters into the habit of moving with a gun in their hands. Here, USPSA/IPSC Grand Master Todd Jarrett rockets between firing points at the 2003 Factory Gun Nationals. Note that his finger is out of the triggerguard and his pistol is pointed downrange in a safe direction as he moves. His win in the Production Division with his Para pistol made him the first shooter to have won national titles in all four USPSA divisions. I have in the past several years attended about 20 firearms training classes, most but not all relating to the defensive handgun. If you can afford it, I seriously suggest you spend the money and take the time to complete some formalized handgun training yourself. At a good shooting school you'll learn more in a few days than you could in years of reading gun magazines and self-teaching. Take lots of notes at the class because you'll be swamped with information, and without written reminders it's easy to forget a lot of it. Although I will shortly make a case for match shooters being in a higher state of readiness than their strictly class-trained brethren, that doesn't mean I downgrade the importance of training classes. 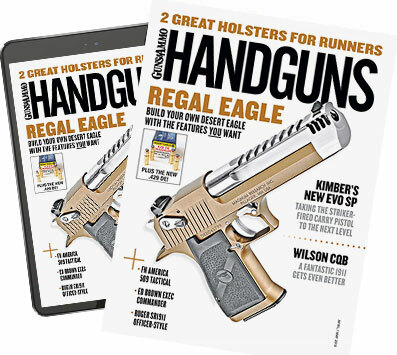 Part of becoming a well-rounded combat handgunner is gathering information and skills from as many different sources as possible. As the very best martial artists tend to be those who've trained in many different arts, the very best shooters are those who've trained with various instructors, been exposed to diverse systems and ideas, then put it all together into something that makes sense for them. The more options you have in your bag of tricks, the better because you never can tell when something you learned at a class will come in handy, whether at a match or to save your life. (1) At pistol matches you never know what they're going to throw at you until you get there; if you're shooting a surprise stage you don't even know what you're up against until you're actually up against it. This gets you in the habit of keeping your mind in gear under stress, of performing on demand with a gun in your hand. This is something you get very little of until you reach the highest levels of formalized handgun training. But even then, match shooters have a serious edge. (2) Even the most ardent student of combat pistolcraft can't attend a training class every weekend because classes simply aren't scheduled that often in any one geographical area. But if you live in a region with a vigorous match schedule you can shoot a match every weekend if you want. This frequency keeps the muscles flexed, maintaining your skills at a high level. aining is expensive. The going rate is about $100 a day, sometimes a bit more. Pistol match fees, by contrast, are cheap. In my area a USPSA/IPSC or IDPA match fee tends to be $15 or $20 unless it's a state or area championship. While you probably can't afford to attend a lot of training classes, you can afford to shoot a lot of matches. One of the most useful skills to be learned during formalized firearms instruction is malfunction clearance drills. Here the author clears a simulated smokestack with his Wilson 1911. (4) In the vast majority of training classes you're standing upright and stationary in the open as you execute your skills. It's been said that we fight like we train, and if all you've ever trained to do is stand in one place in the open and shoot, then under stress, when the bullets start flying, that's exactly what you're going to do. Even if you have an intellectual understanding of the tactical importance of movement and cover, you'll never move under stress because you're not in the habit of doing it. I remember the first time I went through a Simunitions exercise where live opponents were firing real projectiles at me. Under stress I did exactly what I practiced all the time, which was to draw and fire back, standing right out in the open even though good cover was only a few steps away. Need I mention I got waxed big-time? (5) In most shooting classes you have a group of students on line, all shooting at once. I'm not knocking that--it's really the only way to train a large group of people in a timely manner. The problem is that when shooting on line, with other people standing to your sides, you are never allowed to point the gun anywhere but downrange. How many times have you heard, "Don't break the 180-degree plane," and, frankly, if you even get close to 180 degrees you're pushing it. Turning around with a gun in your hand is the ultimate sin. Unfortunately, while we train in 180 degrees, we live in a 360-degree world in which attackers often work in teams, and one or more people may well come in from the sides or rear while you're dealing with the guy in front of you. I really worry we're training people into tunnel vision, to not look behind and around them and scan their surroundings for any attackers who aren't necessarily to the front. In the real world this could get you killed. Which brings us to the level that none of us ever really wants to reach. There's no doubt that people who've actually been in gunfights and/or who operate in environments where there's a high probability of that happening (i.e. SWAT team, stakeout unit) are probably more emotionally prepared than folks who've never had to do it for real. Nothing is more terrifying than the unknown, and once you've done it and come out the other side, it's no longer the unknown. Jim Cirillo, survivor and victor of numerous armed encounters during his days with the legendary New York City Police Stakeout Unit, has said, "During my first gunfight I felt like I was coming apart, like I was turning to water and seeping right down into the floor. But by the time you get to your third or fourth gunfight, it's no big deal." The author has been fortunate to train under some outstanding firearms instructors, including USPSA/IPSC Grand Master Matt Burkett (left). I don't think most of us really want that much experience, but for the people who've done it and emerged alive, it's like being inoculated against a deadly disease. Now, let's put this in perspective: The fact that someone has been in a gunfight and survived doesn't necessarily make him an expert. He might simply have survived through dumb luck. As the old saying goes, "It's better to be lucky than good." Also, the fact that he had this experience doesn't mean he was hardened by it or even that he learned anything from it. But still, beyond question, the people who've "been there, done that," who learned from and were toughened by the process, have an edge over the rest of us when it comes to preparedness. Now that we understand the Hierarchy of Tactical Shooters, how does this relate to our level of preparedness for a real-life self-defense situation? I would say that if you have a lot of experience at any one level in the hierarchy you can probably jump to the next level with minimal trouble. For instance, if you've put in a lot of dry-fire practice but haven't been shooting in a blue moon (Level 1), you can probably go to the range and turn in a respectable slow-fire group on a single target at close combat range (Level 2). If you've put in a lot of time honing your basic marksmanship skills on a standard range, you can probably attend a serious handgun training class (Level 3) and do all right. If you've attended a lot of training classes, you can probably go to a pistol match (Level 4) and turn in a tolerable performance. And if you are a well-practiced competitor in combat pistol matches, you're just about as prepared as you can be to do this for real (Level 5). Problems arise when you have to jump more than one level at one time. The person who never shoots (Level 1) is probably not going to be able to go to a training class or pistol match (Levels 3 and 4) and do well. Likewise, those who've only trained at classes (Level 3) but never broken out of the structured range mentality into the free-form, anything-goes world of combat competition (Level 4) are probably going to have a hard row to hoe in a gunfight (Level 5). Those folks who pooh-pooh match pressure have never watched another person lose it during a match stage. I have, and the problem in every case was that these were people trying to jump three levels at once--from never shooting (Level 1) to combat pistol match (Level 4). The author competes in USPSA/IPSC and IDPA using the same equipment he carries concealed daily, a 9mm Glock 34 in a Blade-Tech standard belt holster backed up by two spare magazines in a Blade-Tech double pouch. I'm not saying it can't be done. I know people who've gone from shooting on the range to competing in combat pistol matches with no formalized class training in between. But for many people, contemplating that jump is frightening. ss environment is expensive; pistol match fees are cheap. I know people who've gone that route, and they did just fine at the match. Competing at a serious combat pistol club will expose you to people who can shoot a lot better than you. You can look at that as a humiliating experience to be avoided or an incredible opportunity to be pursued. Picking those better shooters' brains can be an education in itself. On the other hand, you can also make a case that beginners who've decided they want to be serious shooters should get formal training from a good instructor right off the bat so they don't have to unlearn bad habits later. The hierarchy I've outlined, from Level 1 to 2 to 3 to 4 and hopefully never to 5, is the classic progression. Typically, serious shooters burn a lot of rounds on the range before they get trained, then test their wings in training classes before they compete in matches. I do admire people who can jump straight from the range into a match environment and do well, because I had to have a lot of experience at each level before I felt ready to go on to the next. That's the way I did it, and it seems a good way to go.